Paper Dahlia Wreath – Hurry Up Spring! Flowers That Last 6 Months or More! First Day Of School Bracelets – this is a keeper! I saw these just beautiful pillows on the Better Homes and Gardens site and just fell in love with them. I will have to make some of these! The colors in the picture seem so Springy but I am not sure that it will work with my furniture. Maybe I will try some different colors. The following sewing instructions are for one pillow. If you go to the Better Homes and Gardens link, the other pillow instructions are there. Cut a strip of felt 9 inches wide and 18 inches long and hand-stitch two parallel lines close together through the center of the strip. Pull on the ends of each thread so felt strip gathers into a ruffle. 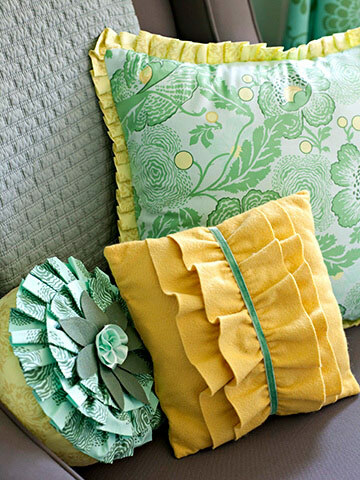 Make a 6-inch-wide ruffle in the same manner. Machine-stitch the 6-inch ruffle in the middle of the larger ruffle. Cut two 12-inch squares from felt. Machine-stitch the double ruffle in the center of one square. Pin a piece of velvet ribbon in the center of the double ruffle. Place the squares right sides together and machine-stitch around edges, leaving a small opening along one edge for turning. Make sure you catch the ends of the velvet ribbon in the seams. Turn right side out and stuff with fiberfill. Hand-stitch the opening closed. These are hand embroidered designs with buttons and felt. I love how the buttons, felt and embroidery just go together. They are so cute! I would love to try this and add similar designs to my sewing. What do you think?